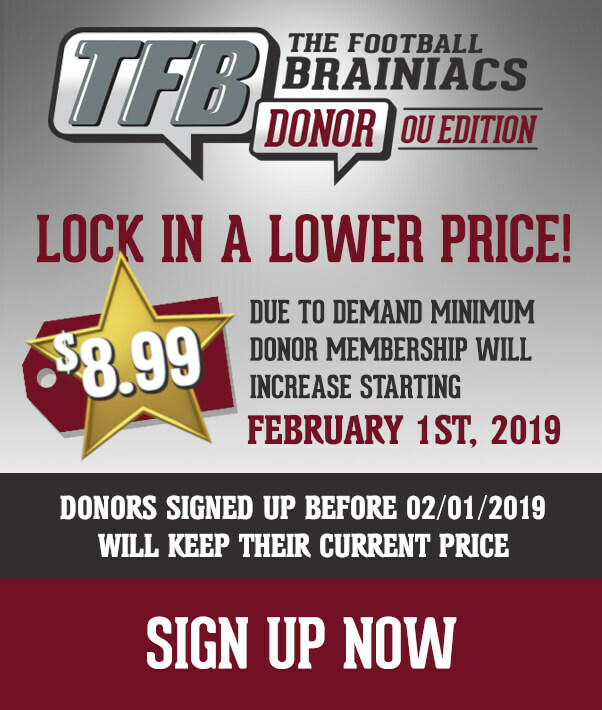 If you are a longtime reader of TFB and have seen my skill player evaluations, you know it is rare for there to be many negatives, if any at all, when looking at the abilities of the players being recruited. Also, if you have been reading the pieces on how I evaluate a wide receiver, you might know what is coming in the next few paragraphs regarding the newest Sooners wide receiver commitment Jaquayln Crawford. With that being said, allow me a minute to point out the negatives about Crawford. He’s 5’10” 163. That is pretty much the only thing I can come up with. Size also is not that big of a negative when you have the skill set Crawford does and, as Ryan pointed out in Crawford’s “BOOM” post, OU has a good track record of taking dynamic receivers and turning them into production machines. It is obvious that Crawford is a phenomenal athlete. The first time I watched his film, I thought, “this kid has some serious quicks and good hands”. When I watched it a second, and then a third, time, I noticed he has some real “in-game” speed, body control, and explosiveness. His 40-yard-dash time is listed at 4.55. His film looks like he is faster than that and his quickness really sets him apart from many others I watch. These are the first two things about Crawford that jump out at me. There are multiple instances on film that show him eliminating the pursuit angles of defenders. This term refers to the instance when a defender has an unimpeded path to the ball carrier and should have the proper pathway to make a tackle. Skill players with real speed are able to take that pursuit angle away and Crawford does this over and over in his film. Not only does Crawford exhibit speed with the ball in his hands, he also shows an ability to blow past defenders off the line of scrimmage. Crawford’s first three steps appear to be extremely quick and he moves with a purpose. He takes himself where he is supposed to go and does not have any wasted movement (more on this in just a bit). There are a couple of examples of tunnel screens that show Crawford’s ability to plant his foot and get north and south in a hurry. I am a big fan of guys who are not afraid to catch a pass and then fly up into oncoming pursuit. Crawford shows he is not apprehensive and, once he gets into that traffic, he displays a “jitterbug” type of quickness that is really dynamic. He would be tough to “tackle” in a flag football game, and that is the kind of guy you want in a player with Crawford’s physical stature. Explosiveness sort of falls into this category, and Crawford’s vertical leap is something that gives him yet another advantage on the field. He really can get up in a hurry; there are multiple examples of him making plays, both offensively and defensively, on the football at its apex. On film, Crawford makes one-handed catches, makes snags up over his head, plucks balls out away from his body, and catches the ball at its highest point. These are all things that you want to see, obviously, when evaluating a wide receiver. The thing I liked the most about his film, however, were the plays he made with his hands on defense. I like seeing guys play both ways. When I was in high school, I was the quarterback, free safety, and punt returner. I never came off the field. Crawford is that sort of player. There are a few examples of him getting a great read on the opposing quarterback’s eyes and coming across the field to pick off a pass. This sort of thing really gets me excited. When a kid can be running full speed across the football field and just snag a football not intended for him, while also blazing back the other direction, it is a sign he has a little something “more.” Crawford makes a terrific one-handed interception on the very first play on his highlight film that sets the tone for the rest of the eight or so minutes of him flying all over the field making plays. This is the one area in which I wish there were more examples. Most of the routes shown on film are of fades, slants, and some screens. I am not doubting Crawford can be a precise route runner, but it is hard to get a firm grasp of his precision by the clips on his film. Using only his quickness and feet as a guide, I believe he probably is someone who can run anything on the route tree and do it very well; however, having polished route running is a huge advantage to young guys making the jump from high school to high level college. I told K and Ryan both that Crawford has a little “Hollywood” in him. While that is not my personal style, it is something that definitely has a place on the football field when kept in check. What I mean by that is you can just tell that Crawford knows he is good. He knows he has speed and quickness to burn and that he is the best player on the field. Check out some of the plays on his film showing him throttle down while guys are in pursuit as fast as their legs can move with little to no hope of coming within ten yards of Crawford. He also stares down guys, who have pursuit angles, as he blazes past them. Lastly, Crawford likes to slow it down right before the goal line and just creep into the end zone. This may not be the preferred on-the-field personality of some, but lately OU has been missing such an attitude. This is why Baker Mayfield has been such a breath of fresh air for a lot of folks. There is a sort of cocky confidence that translates over to production. If Mayfield threw 20 touchdowns and 15 interceptions, people would be telling him to sit down and shut up, right? As we all know, he puts his money where his mouth is. Crawford certainly shows an ability to do that as well and I believe his style of play and on-the-field attitude are qualities all successful teams really need. I am not telling you anything you can’t see for yourself on film. Crawford has great body control, speed, quickness, attitude, and athleticism. One of the things I like the most about him is that he has some toughness to his game. As I mentioned earlier, he is not the biggest guy, but he plays both sides of the ball with aggression and is a return man. There is a certain amount of courage involved with being a kick returner and Crawford fills that role that extremely well. There are a lot of guys who have impressive highlight films. While that is the ultimate goal of said films, there are still a select few who have highlight films that stand out above the rest. I think back to watching the highlight films of Charleston Rambo and CeeDee Lamb. Those guys had films that left me wide-eyed and excited. Guys like that really separate themselves from the “rest of the crowd,” and I truly believe Crawford is that type of player. 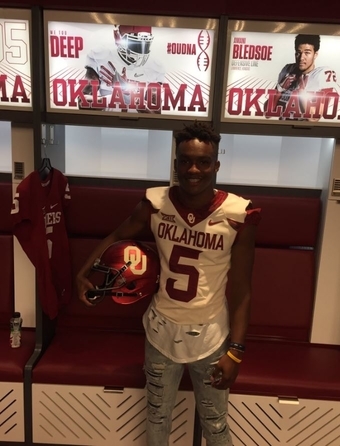 The Oklahoma staff worked hard to pluck him out of Rockdale, which is sort of sandwiched between Austin and College Station, and I believe he may be the sort of young man who becomes a vocal leader in the recruitment of other guys – much like TJ Pledger and Patrick Fields have been. Crawford is a top 150 guy on ESPN and, if he has a monster senior season, I could seriously see him getting close to having five stars in some of the services that do those sorts of rankings. Even if not, the Sooners just got themselves a whale of an athlete.